"Why does my scarf curl?" and "How can I stop my scarf from rolling?" must be among the most common questions asked and re-asked on internet knitting forums everywhere. The root of the question is almost always a plain stockinette scarf -- a rectangle of fabric made back and forth, knitting on one row, purling the next -- although sometimes the question arises from a lace scarf with a stockinette background. The problem is not the yarn, nor the technique--the problem is inherent in stockinette stitch itself. In other words, stockinette fabric rolls because that is its nature. Knowing this after the fact, however, doesn't solve the problem when you've got a tightly curled piece of knitting in your hand--a piece which seems a useless disappointment. It makes me sad to think of all the excitement of a first project turning to disappointment like this, so I've been knitting around and around until three different solutions have been worked out. 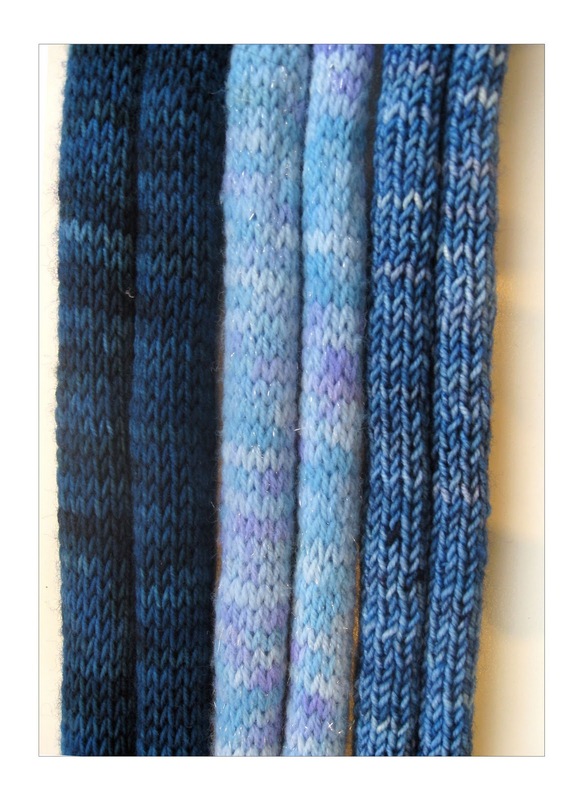 Specifically, I've knit some stockinette scarves which curl like mad--three of them. Over the next three posts,we're going to flatten each one of these and turn each into a lovely, wearable scarf. 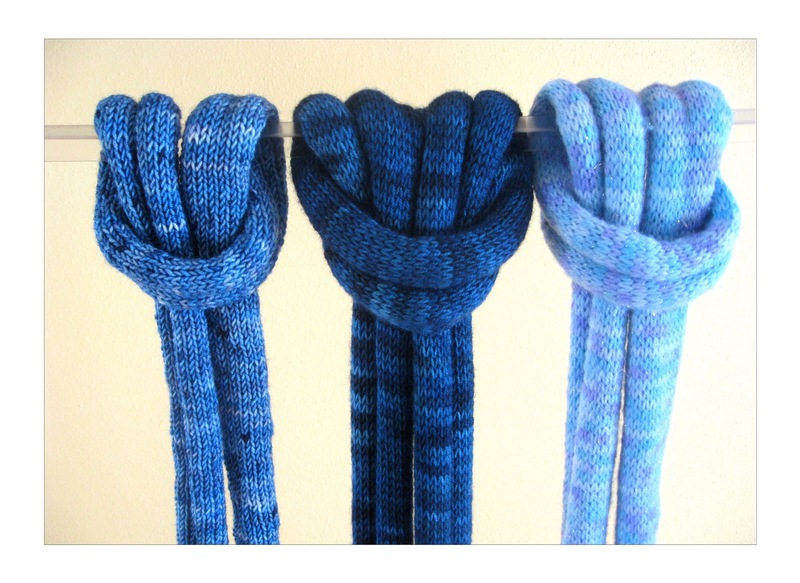 No longer do curled scarves have to be unraveled or put in a drawer: from now on, they can be reworked or corrected. However, before we get to the rest of this series and show solutions which work, let's take a quick detour into solutions which don't work, or at least, which don't usually work very well. Blocking is often recommended for curling the stockinette curl, either steam blocking or regular wet-blocking. This may possibly work on a slick fiber like cotton or bamboo which has been LOOSELY KNIT, and is worth a try in that situation. Yet on animal fibers, or wool or woolly acrylic, this solution is of limited usefulness. The fact is, it is practically impossible to block the curl out of stockinette without taking a real chance that you'll have to resort to actually ironing it. Once on this road, you might find you have to iron the life right out the knitting before it will consent to lay flat. In other words, if you chose to cure stockinette's curl with blocking, then when you finally do succeed in getting the curl out, the knitting has a real chance of having become a limp rag. More commonly, a severe blocking tames the problem temporarily, but the curl returns as the scarf is worn. 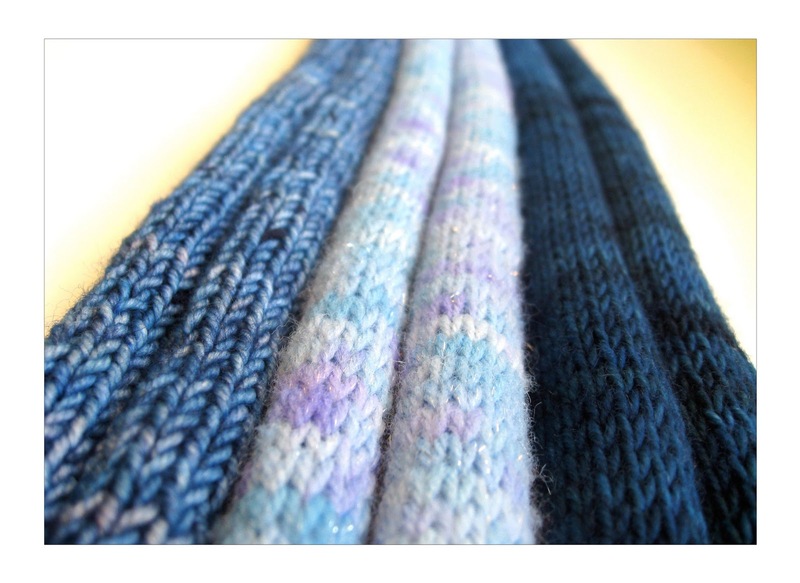 Another popular suggested cure is putting a non-curling edging onto the scarf. Seed stitch, moss stitch or garter stitch are often recommended. It is true that these fabrics do not curl (and are therefore an excellent choice for the next scarf!) 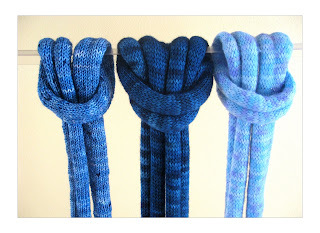 However, the usual result from applying a non-curling edging to a curled scarf is that, although the edging itself does not curl, the scarf to which it is attached will continue to curl, taking the edging right along with it. 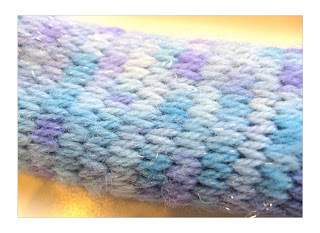 There are ways to attach an edging so that the edging will not curl, but this kind of edging, called zig-zag edging, has to be knitted in, it cannot be applied after the fact. Another species of edging often recommended is to crochet an edging onto the scarf. This also will not work for the same reason a knitted edging will not work: the crocheting itself does not curl, it is the knitting which curls, taking the crocheted edge right along with it. In the next post of this series (drop columns, linky below) we'll flatten the curled-up sparkly blue scarf shown at left.